Creating Custom Controls in Xamarin.Forms on Android. Xamarin.Forms library contains lots of build in controls but not all the time we end up using build in controls. Some time we need to create our own custom controls. For Eg. Radio button is a common control in android but it is not available in Xamarin Forms. If the developer wants to use this control then he has to create a custom control and write a renderer to use the control in Xamarin Android. Lets see how to create a custom control in Xamarin Forms. Create your own custom Xamarin.Forms control. Create a renderer in each platform that will be used to display the custom control. Lets create a CustomRadioButton control in Xamarin Forms which inherits form a View Class. The CustomRadioButton class has two Bindable properties which provides the state of the control whether it is checked or unchecked. Now lets create a RadioButtonRenderer for the CusomtRadioButton control. Xamarin Android has a build in radio button control so lets use that control. now we have the custom renderer which will render our custom control. In OnElementChanged method we are setting the RadioButton as the native control and registering for the property changed event when the element is clicked the control triggers and changes the custom controls bindable property. OnElementChanged method provides the Element, which is our Xamarin.Forms CusomtRadioButton control and the Control which is the RadioButton set using the SetNativeControl method. That’s it, lets use this control. 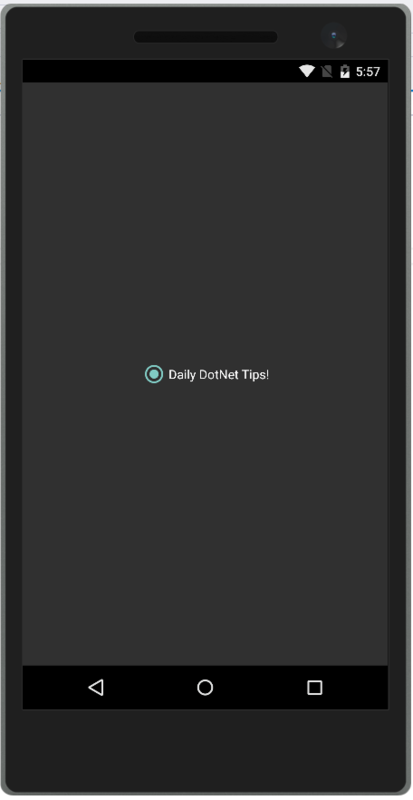 Text = "Daily DotNet Tips!" Hope this post might have helped. Pingback: Creating Custom Controls in Xamarin.Forms on IOS.